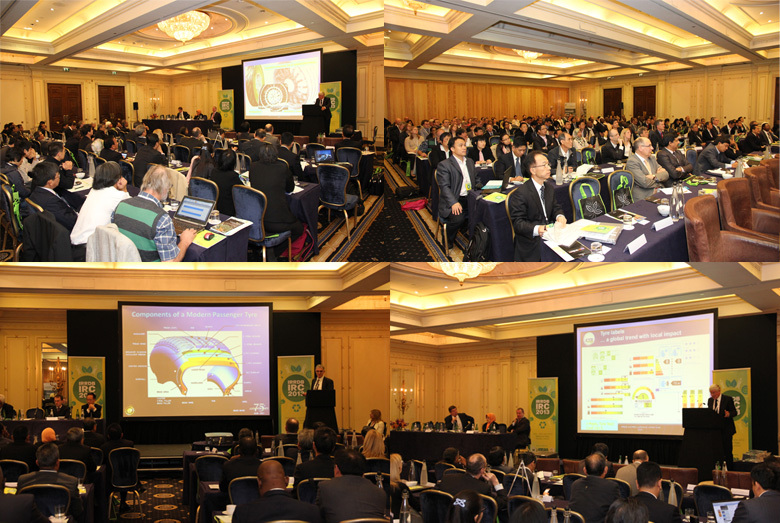 The International Rubber Research & Development Board (IRRDB) met in the UK for the first time in 20 years to participate in its International Rubber Conference 2013. The event was judged by the 200 delegates to be a great success. The conference, together with a field trip to TARRC, were held from 24th - 26th June 2013 at the Millennium Hotel, Mayfair, London and Brickendonbury, Hertford. The theme, ‘Are we ready for green technologies’, challenged participants to examine the issues facing the rubber industry, focusing particularly on green and sustainable technologies. This year’s conference was organised jointly by the IRRDB, Malaysian Rubber Board (MRB) and its UK-based research facility the Tun Abdul Razak Research Centre (TARRC). The conference was attended by representatives of fourteen of the world’s natural rubber producing countries, including not only the top four, Thailand, Indonesia, India and Malaysia, but also Cambodia, Cameroon, China, Côte d’Ivoire, Ghana, Guatemala, Nigeria, Philippines, Sri Lanka and Vietnam. Delegates from the EU involved in all aspects of the rubber industry were also welcomed. A total of thirty presentations were given over the two days days, focusing on green and sustainable technologies relevant to the rubber industry. Topics on the first day ranged from: the rubber economy, the future of the pneumatic tyre, prospects for the global tyre industry, rolling resistance and C02 emissions, ‘green’ tyres and tyre compounds, the potential for carbon sequestration in natural rubber plantations, carbon markets and the use of natural rubber in civil engineering applications and in road surfacing. Two presentations were concerned with rubber production issues and examples from individual countries, including techniques to increase and facilitate production, including use of a biobased latex stimulant, genome research, improved tapping techniques and the Automatic Rubber Tapping System (ARTS), biotechnology and physiology, cultivation and processing of natural rubber, including crop improvement and harvesting, disease prevention and control and guayule as an alternative to natural rubber (Hevea brasiliensis). Above left: The guest of honour was His Excellency Dato’ Sri Zakaria Sulong (Malaysian High Commissioner to Great Britain and Northern Ireland) and the event was opened by Datuk Dr Salmiah Ahmad (Director General of the Malaysian Rubber Board and Chairman of the IRRDB). Above right: Dr Kamarudin Ab-Malek (CEO of TARRC), Dato' Dr Abu Talib Bachik (MRB Board Member), Sir Geoffrey Allen (former TARRC Board Member), Datuk Dr Salmiah Ahmad (Director General of the MRB), Datuk Dr. Abdul Aziz S.A Kadir (IRRDB Secretary General), Dato’ Dr Kamarul Baharain Basir (former Director General of the MRB) and Dr Stuart Cook (Director of Research at TARRC). A conference dinner took place during a river cruise on the Thames on the evening of 24th June. There was also a cake cutting ceremony on board to celebrate the 50th anniversary of the IRRDB. For several delegates this was their first trip to London and they were able to enjoy the spectacular London skyline on a pleasantly warm evening as dusk fell. 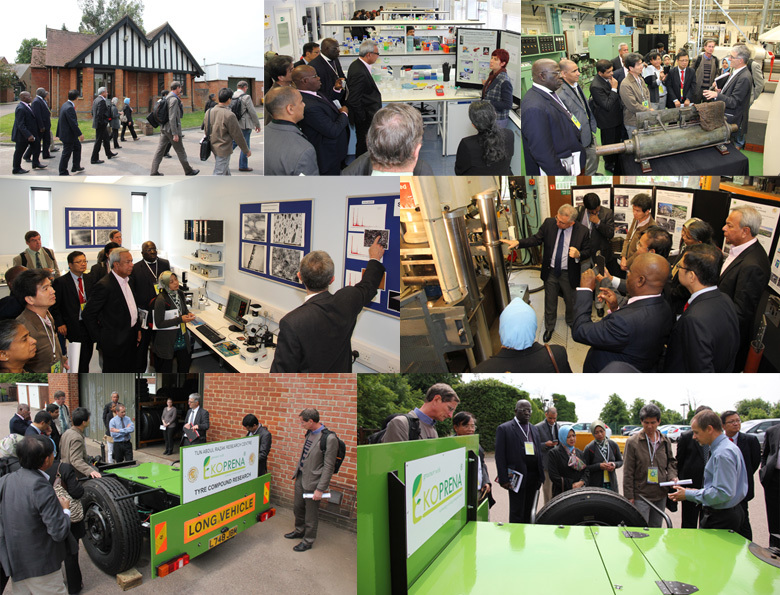 The conference programme also featured a field trip on Wednesday 26th June to the world-renowned laboratories of TARRC at Brickendonbury, just north of London at Hertford. Dr Stuart Cook, Director of Research at TARRC said he 'was very pleased and honoured that the IRRDB chose to hold its Annual Conference in London in the year in which the research centre celebrates its 75th Anniversary’. The two organisations share a common history, and for more than twenty years, until 2000, the IRRDB occupied premises TARRC’s current site at Brickendonbury. Both TARRC and IRRDB can trace their origins at least from the formation of the International Rubber Regulation Committee in 1934 and the International Rubber Research Board in 1937, whose role was to coordinate the work of national rubber research institutes. IRRDB was formed in 1960 when IRRB and the International Rubber Development Committee were joined.